1. 1 pound lobster meat, cooked, cut into inch pieces. 2. 2-pound shrimp, cooked, deveined, cut into 1/2 inch pieces. 3. 1 pound tuna fish, canned, drained, flaked. 4. 1 pound king crabmeat, cooked, cut into 1/2 inch pieces. 6. 1/3 cup onions, minced. 7. Juice of 2 lemons. 9. salt and white pepper to taste. 11. 25 leaves of leaf or romanie lettuce. 12. 25 slice or wedges of lemon. 1. Place the lobster, shrimp, tuna fish, crab. meat, celery and onion in a mixing container. Toss gently. 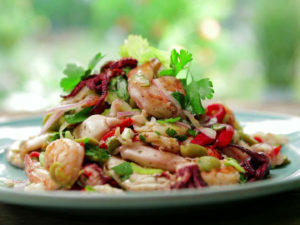 Seafood salad can also be served as an entree or main course salad by increasing the serving portion and serving it in a larger salad bowl. The garnish generally consists of hard boiled egg and tomato slices or wedges. Seafood salad can also be presented on the menu in the form of a stuffed tomato salad. Serve a wedge or slice of lemon with all seafood preparations.